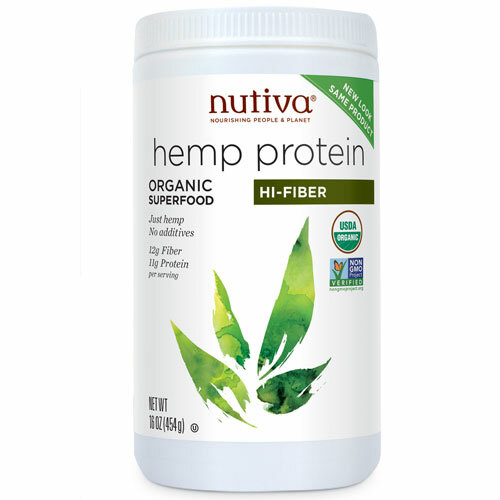 Nutiva`s award-winning Organic Hemp Protein HI Fiber is our protein powder with the highest fibre content, containing 37% protein, 43% fibre and 10% fat. Hemp Protein is ideal for people looking to increase their overall fibre consumption while enjoying the fresh flavour of this nutritious superfood. Below are reviews of Nutiva Hemp Protein HI-Fiber- Organic Superfood - 454g by bodykind customers. If you have tried this product we'd love to hear what you think so please leave a review. I use this mainly in my smoothies it's fine with me. Nutiva`s award-winning Organic Hemp Protein HI Fiber is our protein powder with the highest fibre content, containing 37% protein, 43% fibre and 10% fat. Hemp Protein is ideal for people looking to increase their overall fibre consumption.